We bought our supplies at the local dollar store, but you can find balloons at almost any store! Start with putting about 1/3 off a cup into a water bottle with a funnel. Use a pencil or a chop stick to poke the flour into to bottle. How much flour you need will vary on how big your balloons are. You want to fill the balloon all the way up, but too much flour will make it hard and not enough will make it to squishy. Take one balloon and blow it up as big as you can, then let all the air out. Then blow it up again about half way, and twist it closed (NOT TIED IN A KNOT) just twisted. Hold the twisted part of your balloon and put the opening of the balloon over the water bottle. Hold it tight and allow the neck of the balloon to un-twist. You can now start to squish the flour from the bottle into the balloon. Once all the flour is in the balloon, hold the neck of the balloon and slowly let out the air. SLOWLY if you do it to fast the flour will fly out as well, making a huge mess. 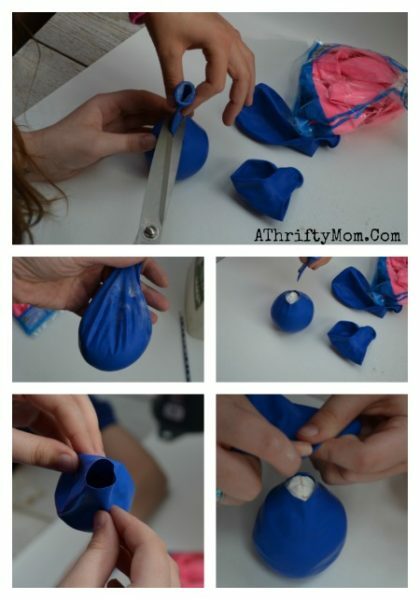 Take a wet rag and wipe off any flour that make have gotten on the outside of the balloon. You need the balloons to make a seal, and if there is flour on the outside they will not seal together. Set the balloon on the table and cut the neck of the balloon off. Take a 2nd balloon and also cut the neck of that balloon off. Put your fingers inside the opening to make the hole larger and wrap it around the balloon you have with flour on it. Careful not to spill the flour out. Once again wipe off any flour that may have gotten on the outside, and do step 7 again with another balloon. For a total of 3 balloon on the outside.